* To detect the presence of vehicle within a prescribed distance is the role of track circuit. * Dropping of track relay is due to shorting of rails by the axles of a vehicle train. * Either wooden or P.S.C. sleepers needed. * Influence of B.R. and T.S.R. values (with weather). * Controlled section length is limited. 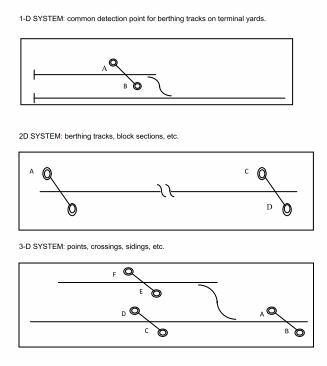 * Insulation joints are compulsory or special type of track circuit is needed joint less working. 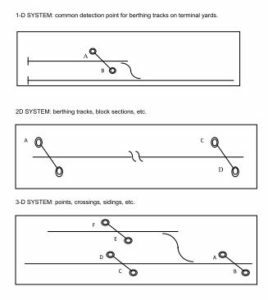 * More maintenance due to varying track parameters..
* It works on magnetic flux variation on a ground device for counting the axles and electronic circuits to evaluate in-count and out-count. To detect the presence of wheel. * It does not require wooden or PSC sleepers. * It can cover very long sections up to 15 kms. * It does not get affected either by flooding or poor maintenance of track. * It does not require insulation joints and so the track can be long welded. * Monitoring of berthing tracks. * Monitoring point zone tracks. 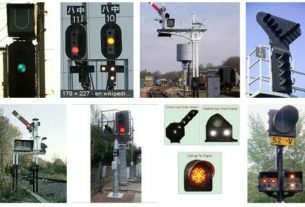 * For automatic signalling system. * For Intermediate block signalling. * Level crossing warning system. * Proving block section clearance. * At steel bridges in lieu of track circuits. 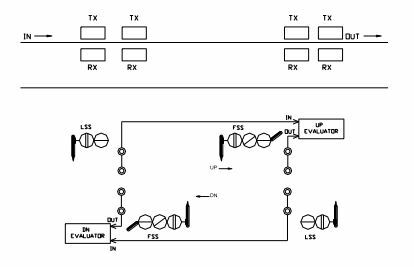 * Digital axle counter (phase modulation). Each detection point consists of a pair of TX/RX units. The tack equipment consists of 4 sets transducers (transmitter and receiver) fitted to the track at each detection point, The two sets at each end (detection point) fixed on same rail are staggered to discriminate the direction of traffic. When power is given to Tx coil the magnetic flux is produced and it links with the Rx coil. The Tx and Rx coils are placed face to face. It produces a voltage in the Rx coil. When the wheel of train passes in between Tx and Rx coil, the magnetic flux linking them is cut and the voltage in Rx coil drops. This change in the level Rx coil is sensed as an amplitude or phase change. Depending upon the particular design, the out put of all the Rx coils (2 frome one end of Axle counter section and 2 from the other end of Axle counter section) are taken to the evaluator located in the station, through Quad cable. Then the‟ IN „count and „OUT‟ count are derived from the filed equipment and evaluated for comparison. If the in count and out count are equal the evaluator shows „SECTION CLEAR„. If there is any discrepancy in the two counts, (it means some wagons / compartments are left in the section) and therefore the evaluator shows „SECTION OCCUPIED„. At the same detection point , if some axles enter into the section and then return, the system will show „SECTION CLEAR‟ , if the in and out count are equal . 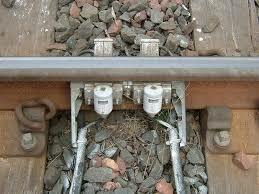 If a non- insulated push- trolley enters the track detections unit, the two axles will be stored as 2 in counts. The evaluator will show section occupied. The push-trolley can be physically lifted off the track and kept aside. Even though the section is clear the system will show section occupied. 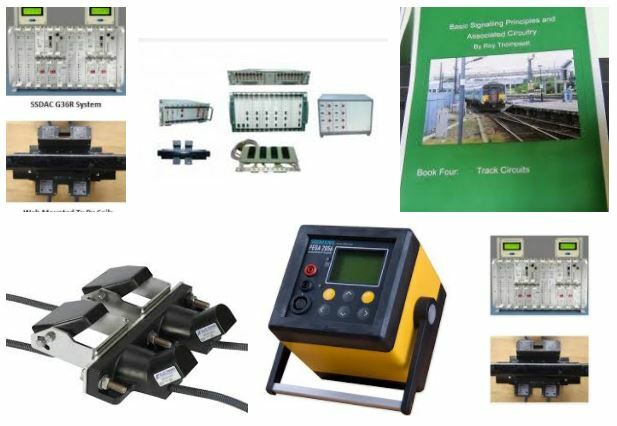 To avoid this, a short two rail length closed track circuit is provided at each diction point and the transducer equipment of the axle counter is fitted within the track circuit. Only insulated push-trolleys are to be used, When the insulated push-trolley passes over the track relay will not drop. In which case, the evaluator will not register the counts . 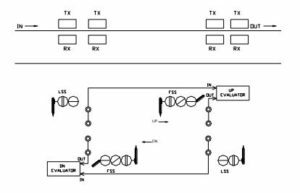 On the other hand, if a train axles passes, it shunts the track and the track relay de-energizes before the axles passes over the transducers in witch case the evaluator will register the count.